During the early years in Greensboro, Methodists conducted Worship services in the Presbyterian Church where Bishop Asbury preached in 1799. A log meeting house was built around 1799-1800 on Laurel Avenue. During 1825-1826, this log meeting house was replaced with a frame structure on the same site. The frame structure was later moved to a location on Broad Street just west of the current Broad Street Campus. In 1859, the frame structure was replaced with a brick building at a cost of approximately $8,000. Because of increasing train traffic interrupting Worship services, planning for a building at a new location was started in 1908. 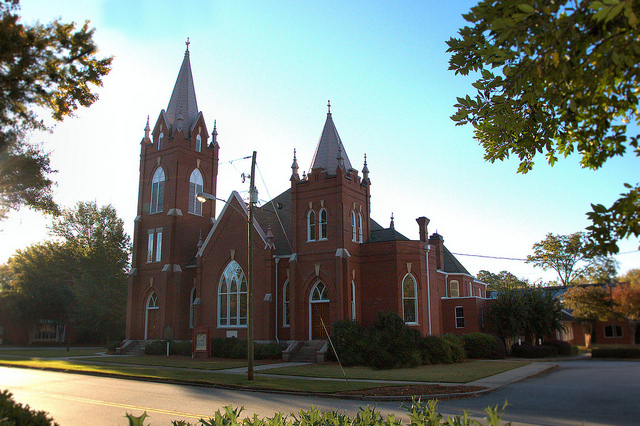 The present Broad Street Campus church was built in 1911 at a cost of approximately $23,000 and expanded/renovated in 1959, 1973 and 1994.